Halloween is upon us which means it makes sense to combine two of our favorite things: black cats and slime! Fudge even “helped” us a little bit but of course wasn’t cooperative for photos. Kids and cats, man! White School Glue – Go ahead and get a gallon. You can find it on Amazon for cheap, and it works just as well as Elmer’s. Liquid Starch – The laundry section of any grocery or big box store should have this. If not, Amazon to the rescue. Black Cat Erasers- I purchased mine at the One Spot in Target. The pack came with purple and green cats too, but I just wanted the black ones for my Halloween slime. Good slime making isn’t about exact measurements. 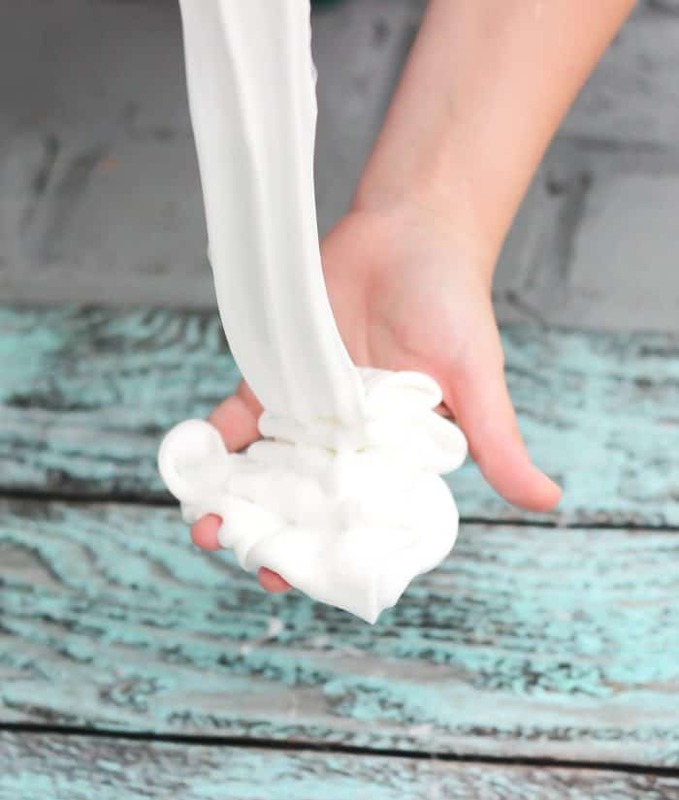 You’ll get the best slime by getting hands-on and creating the perfect texture. Here’s how to get started. At this point, it’s best to get hands-on by taking the slime out of the bowl and kneading it with your hands. If the slime is too sticky, then add more starch. 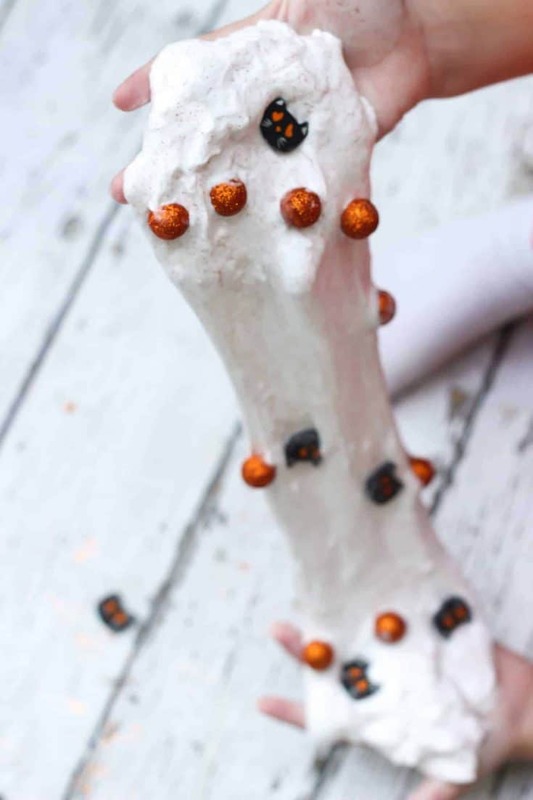 If the slime is too stringy, then add more glue. When the slime is stretchy and none of it sticks to your hands, you know it’s just right. Keep alternating glue and starch if you have to. Worst case scenario, you wind up with more slime than you anticipated and you can save it to make a different slime theme. 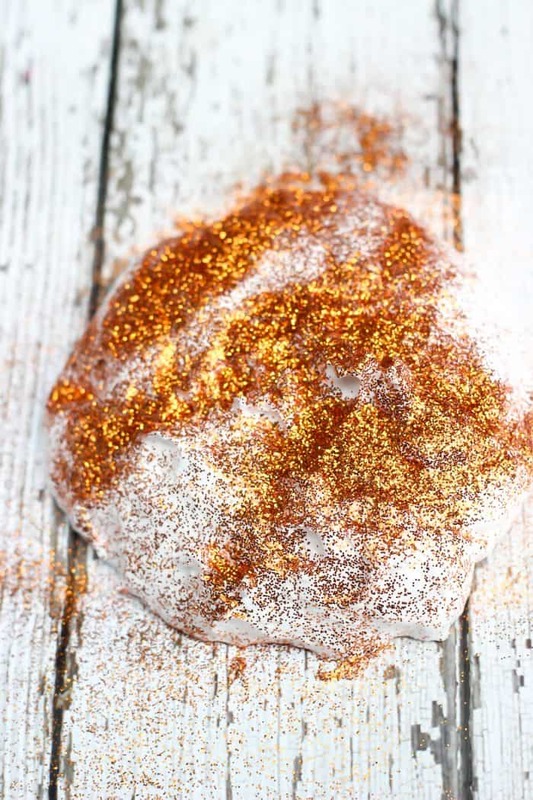 Once your slime is the perfect consistency, add glitter, erasers, and glitter balls. Sweet T does not skimp on the glitter! One of the cool things about using erasers in slime is that they are lightweight enough to mix in and play with, but you can pick them out pretty easily without slime sticking to them if you want to use them as erasers. That’s one reason this black cat slime makes a great Halloween party favor. 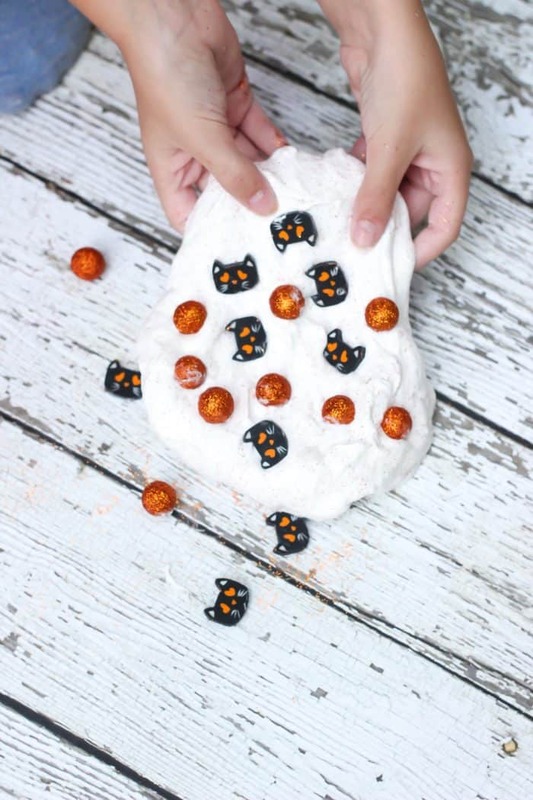 Fun, cheap, and easy kids activity for Halloween: Black Cat Slime! Check out our other Halloween Slimes while you’re here!